According to the NOAA report Carbon dioxide levels rose at record pace for 2nd straight year (graph here from their report). Globally averaged CO2 levels passed 400 ppm in 2015 — a 43-percent increase over pre-industrial levels. In February 2017, CO2 levels at Mauna Loa had already climbed to 406.42 ppm. 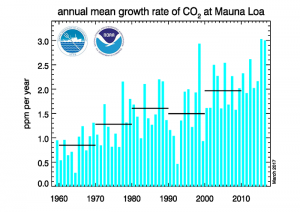 NOAA provides an interactive website with data: Trends in Atmospheric Carbon Dioxide. The calculus materials page here also has Mauna Loa CO2 data and a project. The Economic Policy Institute has a State of Working America Data Library. Here you will find downloadable excel files on employment and wages by race and gender. For example, you might be interested in the median hourly wages for men and women over time (see the graph – you can guess which is women and men). Not only is the data suitable for regression, but also for rich discussion on equality and policy. This data set will get added to the statistics material pages. Kevin Drum keep us updated on the lead crime hypothesis. His latest post on this topic: Lead Update: White Folks and Alabama Prisoners. The lead hypothesis predicts that young cohorts are less crime prone than older cohorts, so their share of the jail and prison population should decline. 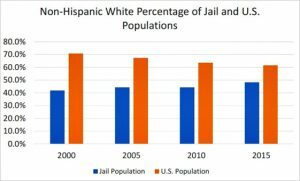 It predicts that black crime rates will drop faster than white crime rates. And it also predicts that small-city crime rates will drop faster than big-city crime rates. All of these things have turned out to be true. The lead crime connection has an element of environmental racism, which is not often discussed. In Statistics Materials you’ll find lead and crime data for linear regression and further information. According to Climate Policy Observer EU electricity companies to cut investment in coal plants after 2020. While this is good news there is still a long way to go. 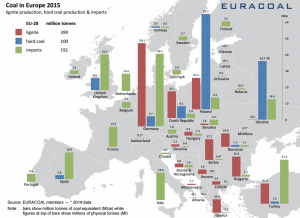 However, coal remains an important energy source for many European member states. According to the most recent EURACOAL data analysis, in 2014 EU indigenous coal and lignite production exceeded indigenous natural gas production by 28 percent and indigenous oil production by 78 percent. If all existing coal plants continue operating to the end of their full life span, Climate Analytics highlights, the EU will by far exceed the level of emissions from coal compatible with the Paris Agreement’s commitments. For the EU to remain within its carbon budget, 25 percent of currently operating coal-fired power units need to be shut down by 2020, rising to 72 percent by 2025, before a complete shutdown by 2030, the study finds. U.S. coal use has been on the decline and you can find U.S. coal data in Calculus Materials. 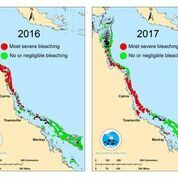 The ARC Centre of Excellence for Coral Reef Studies released the statement Two-thirds of Great Barrier Reef hit by back-to-back mass coral bleaching today (graphic here from them). The Guardian also has a related article, Great Barrier Reef at ‘terminal stage’: scientists despair at latest coral bleaching data, and in that there are graphs that could be used in classrooms if someone wants to track down the data. There are materials on the ARC Center’s page worth exploring. I have just posted a new project in the calculus section dealing with arctic ice and feedback loops. To go along with that here is quick tutorial on the ice albedo feedback loop. If you are looking for U.S. energy data then visit the EIA’s Monthly Energy Review. 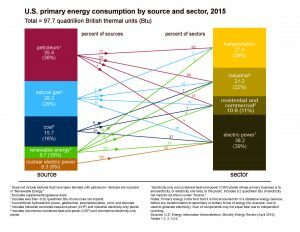 If you are interested in coal or renewable energy, nuclear or natural gas, or consumption by sector, the data is there. You can choose from pdf files or excel files and each data set has an interactive graph link. All data sets are historical providing an abundance of time series. On the right sidebar are interesting graphs like the one here that are archived dating back to 1996. Enjoy. 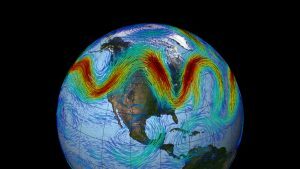 The Washington Post article, One of the most troubling ideas about climate change just found new evidence in its favor, summarizes a recent study on the possible impact to the jet stream due to climate change. The Northern Hemisphere jet stream flows in a wavy pattern from west to east, driven by the rotation of the Earth and the difference in temperature between the equator and the North Pole. The flow is stronger when that temperature difference is large. But when the Arctic warms up faster than the equator does — which is part of the fundamental definition of global warming, and which is already happening — the jet stream’s flow can become weakened and elongated. That’s when you can get the resultant weather extremes. The changes in the jet stream’s flow fixes weather patterns for a longer period of time. So, for better or worse, patterns in weather persist longer. What goes unmentioned in the article is that devastating weather events disproportionately impact the poor. The original paper, Influence of Anthropogenic Climate Change on Planetary Wave Resonance and Extreme Weather Events, has all the technical details. This blog is generally not meant to be explicitly political, although there is no doubt that the posts and data provided here are minimally implicitly political. There will be occasions where a more explicitly political post will appear and this is one of these times. The NYT has an article on the proposed presidential budget and how it will impact science research: Scientists Bristle at Trump Budget’s Cuts to Research. 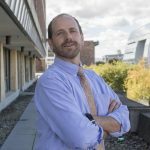 Still, the extent of the cuts in the proposed budget unveiled early Thursday shocked scientists, researchers and program administrators. The reductions include $5.8 billion, or 18 percent, from the National Institutes of Health, which fund thousands of researchers working on cancer and other diseases, and $900 million, or a little less than 20 percent, from the Department of Energy’s Office of Science, which funds the national laboratories, considered among the crown jewels of basic research in the world. Their appearance at such high latitudes is most likely linked to thawing permafrost which in is in turn linked to overall rise of temperature on the north of Eurasia during last several decades,’ said a spokesman. The summer was abnormally hot for the Yamal peninsula, with the air temperature reaching 35C. This heat impacted on the depth of seasonal thawing which grew both deeper spread wider than in the past, so causing the formation of new lakes and a noticeable change in the regional tundra landscape. Scientists are simultaneously observing the sudden formation of the large craters, evidently caused by eruptions or explosions of methane gas which has melted below the surface. 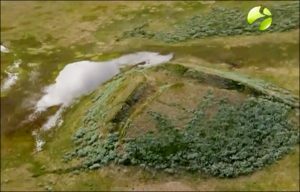 This is another situation where warming permafrost is related to the release of the greenhouse gas methane, which then adds to warming. In other words, a positive feedback loop. There are some excellent photos in the article.